Another three weeks has gone by in the blink of an eye and without a whisper from me here on the blog. What can I say? Work has been majorly kicking my behind. Fortunately, I think I can see the light at the end of the tunnel. But for the project I am working on, I foresee many future busy periods. A little break will be nice though! This weekend I ran another race. The race was hosted by the same group that put on the Thriller in Schiller that I ran at the end of October--Muddy Monk. 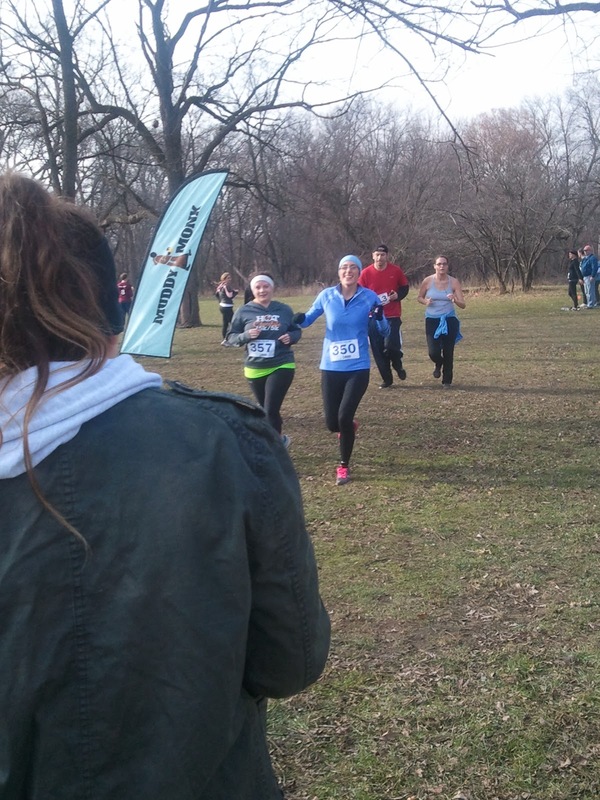 Trail races are a completely different beast than road races. The feel overall is much more relaxed (although I am never super serious at either). I don't even know how people run fast on trails since I spent 85% of the race with my eyes on the ground and the other 15% of the time I am watching out for low hanging trees! This might also be because I am clumsy and roll ankles like it's my job. I showed up at Schiller Woods about 40 minutes prior to the race and breezed through packet pick-up. The $30 registration (cheap!) included a cotton long-sleeve tee, a mug, and a shot glass. It was a little bit chilly so I went back to my car to warm up for about 10 minutes. I knew I would heat up really fast once I started running so I didn't want to wear too many clothes. About 20 minutes before the race, I headed back out to the start area to meet up with some other bloggers including a couple of new-to-me faces! The 10k started at 10 am and Kim, Erin, Lindsay and I ran together. This race was less "technical" than the Thriller 5k (that's the fancy word the experienced trail racers are using, I would say it was less "traily" but alas, that isn't a word. In other words, there were less fallen trees to climb over or under). We did cross under a very muddy bridge twice, but other than that nothing crazy. I think we were running at about a 10 min/mile pace and that was comfortable to me. I did notice that my calves and the rest of my lower legs and feet seem more tired than I normally experience on these trail runs. I'm guessing it is from the very varied terrain instead of the flat road that I usually run on. By about mile 3, I started to get warm and tried to push up my sleeves. It really didn't do much good. I wish I would have worn less clothing, but it always hard for me to gauge what I need to wear. Miles 3 and 4 were super close together and, as it turned out, the trail was mismarked and we missed a half mile out and back section there. I was wishing I had just run the 4 minute mile I've always dreamed off. The four of us crossed the finish line in about 56:45 (my official time was 56:53.9). Due to that missed out-and-back the 10k ended up being more like 5.2 miles. We stuck around the finish line to watch Kelsey and Kim finish. At the end of the race, there was free hot chocolate, coffee, and chili. Due to the great weather on Saturday, many people stuck around following the race and so the lines were long. I wasn't super hungry so I just munched on a few pretzels before calling it a day. I had book club to get to that afternoon so I couldn't stick around too long anyway. Overall it was a great race and I hope to do more Muddy Monk trail races in 2013. For the price, the swag is excellent and it's nice to run a race every once in a while when you are running alone 95% of the time.